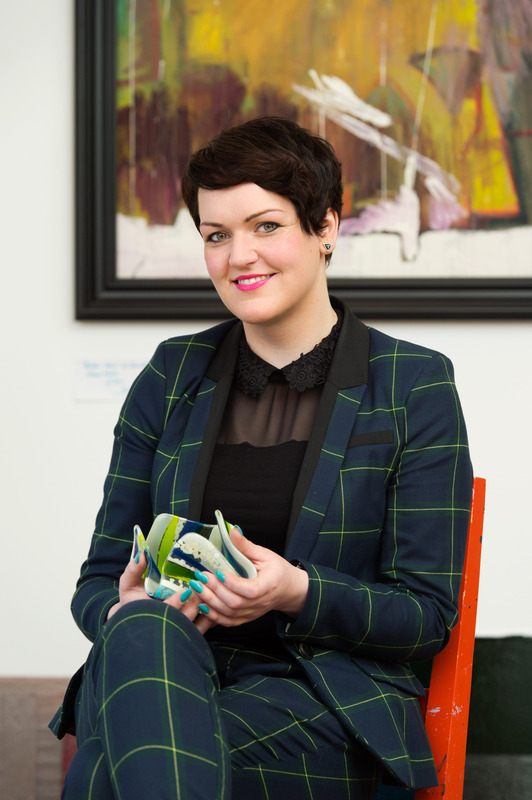 An Aberdeen artist with a crystal clear commercial vision. Shelagh Swanson confounds stereotypes of the starving artist through the development of her granite city shop and studio. She’s as striking and stylish as one of her very own paintings or pieces of handmade glass, but Aberdeen-based Shelagh Swanson confounds stereotypes of the starving artist. As a fully fledged member of Scotland’s creative industries, Shelagh’s granite city business, Oil & Glass, is a shining example of success. Primarily a showcase space for exhibiting and selling Shelagh’s own stunning paintings and glittering fused glass pieces, Oil & Glass also creates commissions to order, and provides regular classes for novice glass-makers. Bathed in light streaming through its north eastern windows, Shelagh’s Oil & Glass shop and studio reflects her own crystal clarity about commerce, and her strong sense of self. This is a woman who certainly sees through a glass brightly. However, art was an unexpected direction for this northern lass to follow. 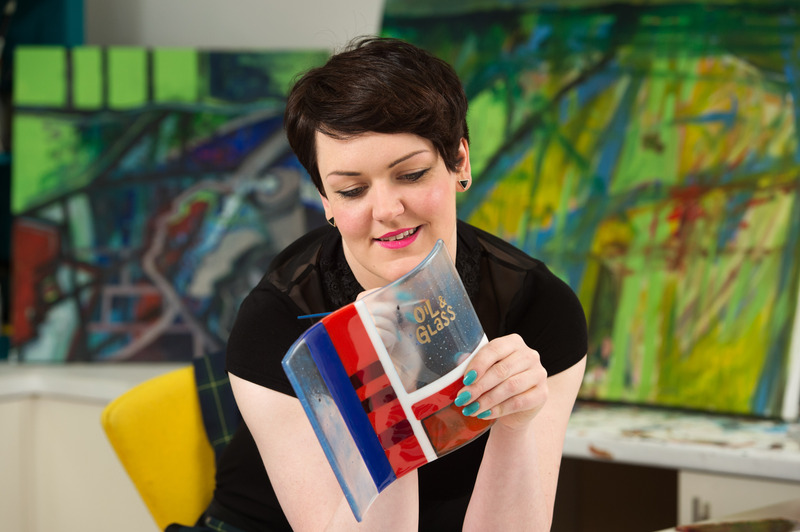 Brought up on a farm halfway between Thurso and Wick, Shelagh broke the family farming mould when she went south to Aberdeen to study painting at Gray’s School of Art. After graduation, an unexpected opportunity took Shelagh back home to work part-time in a Caithness gallery, leaving time for teaching, and her beloved painting. But even back then, she was a woman designed to grasp opportunity. A spell as an artist in residence gave Shelagh exposure to glass-making, and the guidance of a creative mentor. Learning advanced glass-making technical skills, and meeting working artists showed Shelagh that it was perfectly possible to make a living from art. Still slightly cynical about all things crafty, it took the offer of a stall at a craft fair to fully switch Shelagh on to the commercial possibilities of glass. But when she sold all her stock of glass jewellery in one day, she shrugged the chip off her shoulder, and embraced enterprise. That very first income was spent on a specialist kiln, set up in her Caithness cottage, and business began. Shelagh soon resigned from her job and started a stall in the seaside village of Footdee. Selling her glistening glass wares to enthusiastic day trippers, Shelagh’s stall soon expanded in size, as did her ambitions. An Aberdeen City Council competition offered free city centre shop space for a year, and Shelagh used her granite hard determination to make sure she landed the prize. A steep curve in business planning followed, but Shelagh made the most of the PR to get her brand known, and customers found. So when she opened the original Oil & Glass shop to artistic and entrepreneurial acclaim in 2012, she was already set for success. And after only 18 months trading, Shelagh once again saw an opportunity to improve her offering and expand, with a new location and an even better business plan. Oil & Glass now trades as a limited company in Aberdeen’s Holburn Street, and self-confessed control freak Shelagh has taken on three part-time staff to help spread the load. She says it’s been brilliant to use the word “we” in her business, but she’s still learning to trust her team to meet Shelagh standards. With Oil & Glass, Shelagh Swanson has shrugged off the naysayers who are cynical about commerce and creativity. This sparkling young woman has shown that her vision for art and enterprise is crystal clear, and rock solid too.